Frequency is the number of occurrences of a repeating event per unit time. It is also referred to as temporal frequency. The period is the duration of one cycle in a repeating event, so the period is the reciprocal of the frequency. For example, if a newborn baby's heart beats at a frequency of 120 times a minute, its period (the interval between beats) is half a second. Three cyclically flashing lights, from lowest frequency (top) to highest frequency (bottom). f is the frequency in hertz (Hz), meaning the number of cycles per second. T is the period in seconds (s), meaning the number of seconds per cycle. T and f are reciprocals. For cyclical processes, such as rotation, oscillations, or waves, frequency is defined as a number of cycles per unit time. In physics and engineering disciplines, such as optics, acoustics, and radio, frequency is usually denoted by a Latin letter f or by a Greek letter ν (nu). In SI units, the unit of frequency is the hertz (Hz), named after the German physicist Heinrich Hertz: 1 Hz means that an event repeats once per second. A previous name for this unit was cycles per second. A traditional unit of measure used with rotating mechanical devices is revolutions per minute, abbreviated RPM. 60 RPM equals one hertz. The SI unit for period is the second. Sinusoidal waves of various frequencies; the bottom waves have higher frequencies than those above. The horizontal axis represents time. Above the range of frequency counters, frequencies of electromagnetic signals are often measured indirectly by means of heterodyning (frequency conversion). A reference signal of a known frequency near the unknown frequency is mixed with the unknown frequency in a nonlinear mixing device such as a diode. This creates a heterodyne or "beat" signal at the difference between the two frequencies. If the two signals are close together in frequency the heterodyne is low enough to be measured by a frequency counter. Of course, this process just measures the unknown frequency by its offset from the reference frequency, which must be determined by some other method. To reach higher frequencies, several stages of heterodyning can be used. Current research is extending this method to infrared and light frequencies (optical heterodyne detection). When waves from a monochrome source travel from one medium to another, their frequency remains exactly the same — only their wavelength and speed change. All of these waves, from the lowest-frequency radio waves to the highest-frequency gamma rays, are fundamentally the same, and they are all called electromagnetic radiation. They all travel through a vacuum at the speed of light. Another property of an electromagnetic wave is its wavelength. The wavelength is inversely proportional to the frequency, so an electromagnetic wave with a higher frequency has a shorter wavelength, and vice-versa. Sound is made up of changes in air pressure in the form of waves. Frequency is the property of sound that most determines pitch.The frequencies an ear can hear are limited to a specific range of frequencies. Mechanical vibrations perceived as sound travel through all forms of matter: gases, liquids, solids, and plasmas. The matter that supports the sound is called the medium. Sound cannot travel through a vacuum. The audible frequency range for humans is typically given as being between about 20 Hz and 20,000 Hz (20 kHz). High frequencies often become more difficult to hear with age. Other species have different hearing ranges. For example, some dog breeds can perceive vibrations up to 60,000 Hz. The frequency range of a system is the range over which it is considered to provide a useful level of signal with acceptable distortion characteristics. A listing of the upper and lower limits of frequency limits for a system is not useful without a criterion for what the range represents. Many systems are characterized by the range of frequencies to which they respond. Musical instruments produce different ranges of notes within the hearing range. 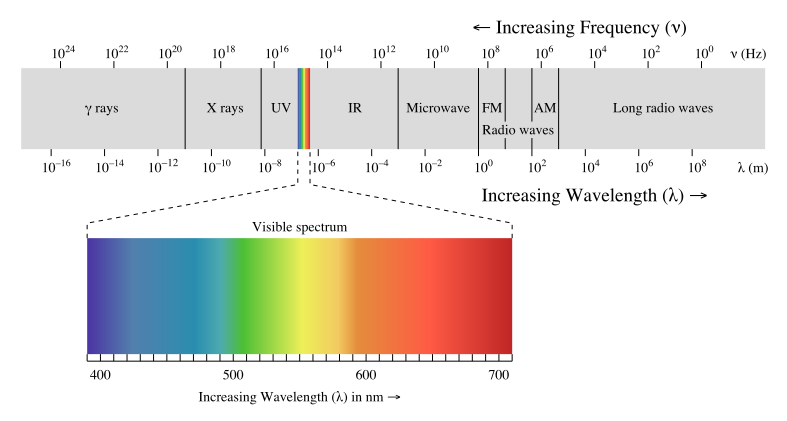 The electromagnetic spectrum can be divided into many different ranges such as visible light, infrared or ultraviolet radiation, radio waves, X-rays and so on, and each of these ranges can in turn be divided into smaller ranges. A radio communications signal must occupy a range of frequencies carrying most of its energy, called its bandwidth. Allocation of radio frequency ranges to different uses is a major function of radio spectrum allocation.